This story begins some months ago with a seed planted in my head by my supervisor in regards to the city of Kingston in Ontario. She had mentioned that there was a coffeehouse on every corner and that it would be a great place for me to visit. I thought to myself that such news was odd since that in my Canadian online research and in talking with Canadians, no one had ever mentioned anything worth a stop in Kingston. So without knowing where to go from there, I filed the thought off to the side. Then a couple weeks ago, it just so happened that the wife and I happened to be going to Kingston for some relaxation amidst the beautiful onset of spring. So upon arrival I dusted off the past conversation about coffeehouses on every corner and made sure to keep my eye out. Sure enough, there were literally coffeehouses all around the downtown area. But then a horrid reality seemed to sink in as we popped into a few; most of them didn't seem to have a lick of an idea of what a good coffeehouse looked like. Some had espresso machines that seemed massacred by a robot army, others proudly touting how great their French Vanilla Cappuccino was. 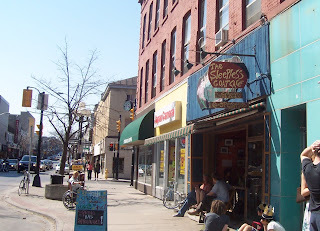 Finally we stumbled upon a place that looked half decent called the Sleepless Goat Cafe. The front of the place boasted a renaissance-fair-ish sign above a small awning that did a fair job in shading a few spots of outside seating. The interior was a little roomier though a bit grungy and very bohemian. The seating consisted of tables and a few booths that proved very hard to get in and out of with their cushions not nailed to the seat. The coffee comes from a Canadian coffee roaster called Equator that basically focuses on fair trade and organic coffees (as do all things served at the Sleepless Goat). I was served a coffee called Dr. Joe (or something like that) that came off bright but a bit burnt. The espresso was fair though it tasted more like a dark cup of french press then espresso. I think the tea was free leaf (didn't write it down) and as a side note, they also serve alcoholic beverages. While I can say that the (lack of) signs had warned me, it's always sad to walk away from an establishment (never mind a whole city) that is in need of coffee refinement. Inversely, I could see the Sleepless Goat really transcending their neighboring coffee establishments with a slight aesthetic makeover as well as more passion on the coffee quality. If you happen to be in town and not feeling so adventurous to hop through the many coffee establishments, give the Sleepless Goat an attempt.